Sales presentations are performances. If you are speaking for business before an audience, you must be able to speak publicly, confidently and convincingly. Sounds obvious, doesn’t it? And yet, how many business presentations have you attended where you couldn’t hear or understand the speaker? Many business presenters worry about public speaking. If you feel nervous, apprehensive and uncomfortable about presenting your case to an audience big or small, you are not alone. There are, however, a number of key areas you can work on. Could Your Business Benefit From More Effective Meeting Facilitation? Our free advice library offers useful presentation tips in a variety of key areas with a range of unique documents available to download. 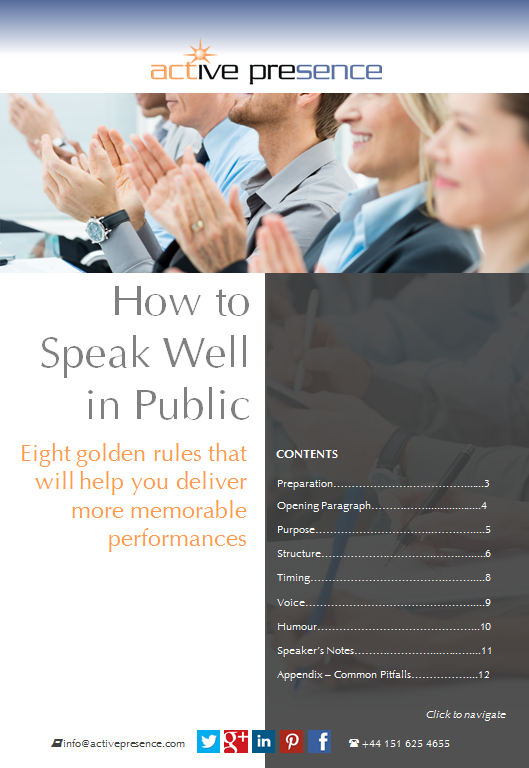 How to Speak Well in Public, the Expert Guide, will help you to control your nerves and allow you to deliver more natural, personable public speaking performances. Fear of public speaking is incredibly common amongst presenters speaking for business. After all, being an expert in a specific field of study often requires a skillset completely separate to that of performing before an audience. However, creating a planning process for high impact sales presentations can help to enhance your reputation for excellence and authority within your business field.